Cat owners can breathe a sigh of relief: Your feline’s litter box likely won’t put your family’s mental health at risk. “The message for cat owners is clear: There is no evidence that cats pose a risk to children’s mental health,” said study author Dr. Francesca Solmi, of University College London Psychiatry. To find out, the researchers followed nearly 5,000 people born in the early 1990s until they were 18 years old. Specifically, the study looked at whether the participants’ mothers had a cat during pregnancy or if the participants grew up in a home with a cat. 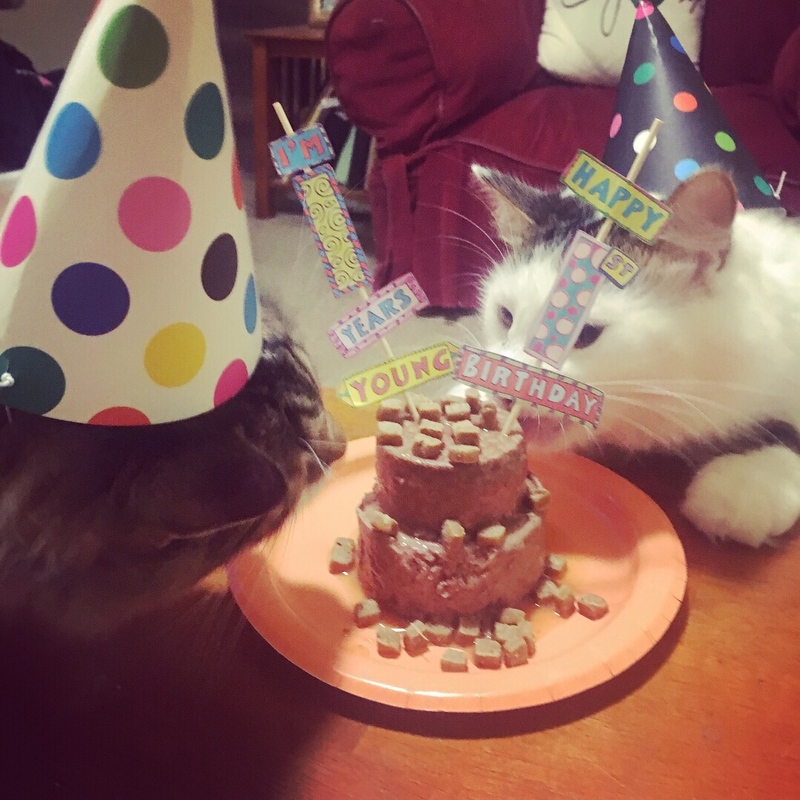 Sharing your home with cats has many benefits but one of the downsides is that owning cats also means owning the odors that come along with them. The irony of course is that cats themselves don’t smell! In fact, they are fastidious about cleanliness. The “smell” people associate with cats is usually because the humans aren’t doing their part to keep things clean. Bacteria are usually the source of smells, so focus on areas where these bacteria breed and grow and you can catch odor early before it gets bad. Here are 5 ways to keep your home fresh, whether you have one cat or a whole gang of them. Not surprisingly, litter box smell can be overpowering and permeate your entire home if left unattended. Make sure you are scooping litter boxes at least once a day and more often if you can. Then, get that waste out of the house quickly! Consider sprinkling a bit of baking soda in the bags you use to collect the litter box contents. This might help keep the odors in check in your outdoor garbage until garbage day. Another great use for baking soda is to sprinkle some at the bottom of the litter box to help absorb odors. Even if you’re scooping regularly, make sure to change the litter completely a couple of times a month because bacteria remain in the box even after you scoop. Wash out the box with unscented soap and water each time you change the litter and remember to replace the entire box once or twice a year. 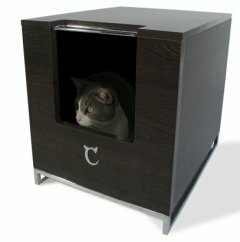 Also, be sure to check out the litter boxes and accessories at MyThreeCats.com! If you can’t easily determine the source of an odor in your home, do some detective work to find out if your cat’s doing his business outside the box. Check corners, behind furniture and in closets to find out if your cat’s been peeing or pooping where he shouldn’t. Also check along walls and the walls themselves to determine if you have a spraying cat. If your cat has been using a spot in your home as his alternative potty spot, use an enzymatic cleaner to clean the area or items or, ideally, throw them away. Also, it’s important to remember that if your cat is peeing or pooping in strange places, please schedule a vet visit. Sometimes this type of behavior is a symptom of a medical issue. If you have cats or any type of pet, be diligent about vacuuming. And don’t stop with the carpet. Make sure you regularly vacuum rugs, couches, chairs and even draperies to capture fur, dander and, yes, odors. Again, sprinkling baking soda on carpets or furniture and then vacuuming it up can help keep things fresh. Don’t forget to wash your cat’s favorite blankets or cat bed on a regular basis. Remember, your cat’s paws dig in the litter box several times a day. There’s bound to be some transfer of germs and odor-causing bacteria. Keep those snuggle spots clean! Your cat’s food and water areas are another prime breeding ground for bacteria. Sitting water, like the water in your cat’s bowl, can quickly grow bacteria, eventually leading to an unpleasant smell. And, you certainly don’t want your cat drinking out of it! Wash the water bowls and replace with clean water at least once a day. Food that sits out can also lead to a smelly mess. Make sure to clean up spilled kibble and especially chunks of uneaten canned food that your cat may have missed. Just because you have cats in your home doesn’t mean it has to smell like you have cats in your home! Keep on top of regular cleaning and be aware of stinky trouble zones, and you’ll have a fresh clean house for everyone in your family to enjoy! Do you have a tip to share us with us? 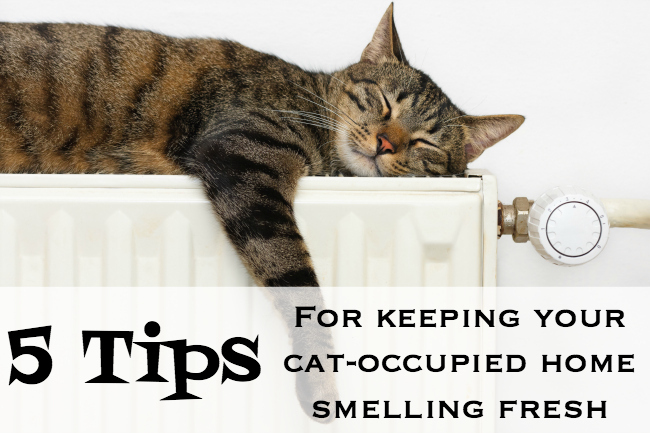 How do you keep your cat-occupied home smelling fresh? Let’s chat about it in comments below!